Description: A bas-relief of Gillies riding a horse and blowing his bugle is located above the inscription on this diamond-shaped stone monument . FREEDOM. / *"SWEET AND FITTING IT IS TO DIE FOR ONE'S COUNTRY." Materials & Techniques: Granite, bronze. Subject notes: Gillies was a young soldier serving for 'Ã·Light-horse Harry' Lee's cavalry. He was killed in Guilford County by Tarleton's dragoons during a retreat prior to the battle of Guilford Courthouse on February 12, 1781. 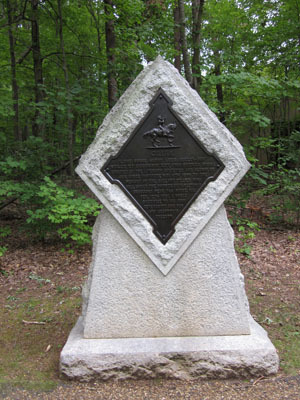 Landscape: This particular monument is located in a row of similar structures that include the "No North-No South Monument, the Turner monument, and the Captain James Morehead (tent) monument.